The majority of rhythms in Western music are grouped into divisions of four or three. This is particularly true of the fast licks you often here in ‘shred’ guitar soloing. For this column, I’d like to show you how to shred using quintuplets (five notes per beat). This is an exercise I devised to help you become comfortable with playing five notes per beat. You must play to a click track or metronome, and start off very slow (around 60-80 BPM). Descending through a hybrid Dorian/Blues scale in the key of E minor, start by playing a repeated series of four sixteenth notes followed by a quarter note (as in bars one and two). Then, without pausing, try playing quintuplets by slightly speeding up and, instead of holding the last note, go straight back to the first note and keep repeating the pattern (as in bar three). Make sure that the first note of the grouping is always played on the beat and that the five notes are spaced evenly. After a while, playing five notes per beat should start to feel more natural and you can speed it up. This is the same concept as Exercise 1, only here we ascend though the hybrid Dorian/Blues scale. As with the first exercise, I’ve only notated three bars. You can of course practice the first and second parts as many times as you like. The key is to try and make a seamless transition between playing in divisions of four, and then playing in divisions of five. For this exercise, I’ve joined the quintuplet runs from Exercises 1 and 2 into a repeated, circular lick. I feel that this creates a very smooth and fluid effect. Even though you’re playing a lot of notes, when played fast, they blend together to create a different sound than standard three or four note rhythmic grouping ‘shred’ licks. Once you have the quintuplet lick from Exercise 3 mastered, try it in a musical context – as I’ve done here by using different positions of an E Dorian scale over a Im-IV-III-Vm-IV-III chord progression. 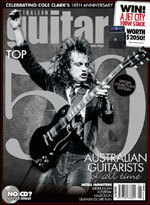 If any of this sounds a bit confusing, please go to www.australianguitarmag.com.au where you can hear me play these exercises fast, slow, and to a click. As an example, I’ve also included an excerpt from one of my own songs (‘Shining Brightly’) where I use a looping quintuplet lick to bring the solo to a climax.